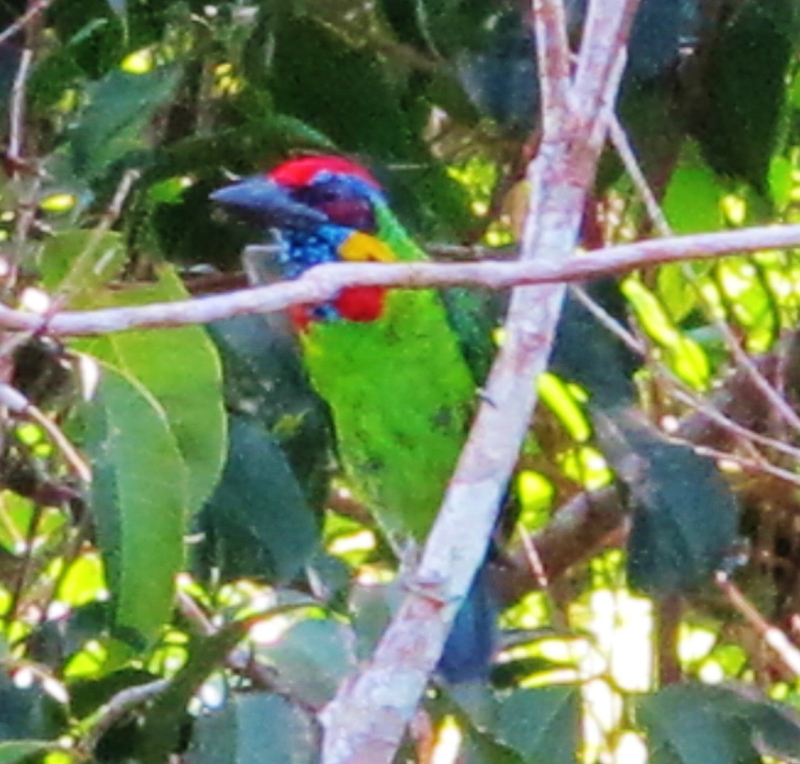 Opportunistic and rather blurry shot of a Red-crowned Barbet, Trang Botanical Gardens, July 22nd. From Malaysia, we flew into Hat Yai on an incredibly cheap Air Asia flight ($22 per ticket), and continued by local bus to the small town of Trang. The nearby botanical gardens with their canopy walkway provided an opportunity for me to add some more “southern” birds to the year list, and I spent a few enjoyable hours here one afternoon and again the following morning. The Trang botanical gardens make an excellent day trip for birders and non-birders alike. About 10km south of the town, they form a small remnant area of tropical lowland rainforest and swamp forest, and some more open park-like areas with planted trees. 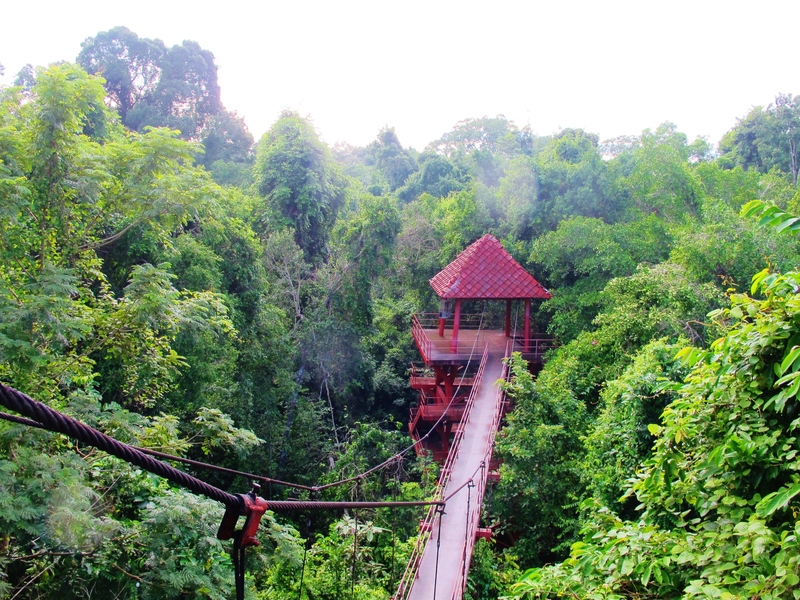 Most interestingly, there is a multi-towered canopy walkway, with metal bridges of various heights between the towers allowing for good views of different levels of forest vegetation. Access to the botanical gardens is free of charge, and when I visited there was virtually no one else there. Despite the botanical gardens’ many attributes, birding was fairly slow, but over the course of my visits I did pick up several lifers including the quite magnificent Red-crowned Barbet. From the highest walkway tower, I had great views of a Square-tailed Drongo Cuckoo, which was also calling throughout my visit. This bird has been recently split from the more northerly Fork-tailed Drongo Cuckoo. I also flushed a day-roosting small owl, but unfortunately couldn’t relocate it. The canopy walkway at Trang botanical gardens. From Trang, we moved north to Krabi town for a three-night stay. About 50km south-east of the town is the infamous Khao Nor Chu Chi (KNC) reserve, until recently known as the only remaining site in the world for Gurney’s Pitta (fortunately a fairly large population has recently been discovered in southern Myanmar). These colorful and very elusive birds sadly became functionally extinct at KNC in 2014, when the last two remaining females and lone male finally disappeared. I’ve been to KNC on a number of occasions since 2006, and always tried to find a Gurney’s Pitta for myself, being reluctant to pay the quite extortionate 9,000 baht that well-known guide Yothin charged for his services. With hindsight, having never managed to self-find a Gurney’s, I should have paid the money. Anyway, no visit to Krabi would be complete for me without a nostalgic visit to KNC. I set off early on a rented motorcycle while it was still dark. On arrival at the site, it was clear that things continue to change. The Emerald Pool entrance area is now an ever-growing mess of food stalls, coffee stands and an enormous coach park, while the main trail past the entrance gate (“A” trail), where Gurney’s and Malayan Banded Pittas were formerly regular in the early mornings, is now lined with trash cans. On all sides of the reserve, the inevitable oil palm plantations continue to encroach on the fragments of remaining primary forest. It’s all rather depressing. Some pockets of nice habitat still exist, but birding is a frustrating experience here at the best of times, as even in the good old days the site was notorious for producing very few birds at all on a typical visit. True to form, I saw very little for the first three hours. After exploring the trails near the Emerald Pool, I wandered over to “U” Trail and lingered in the first gully for an hour, a former Gurney’s Pitta hotspot. Here I saw just two individual birds, an Emerald Dove which landed on a low branch just five feet from where I stood motionless, and a Rufous Piculet which lingered nearby for quite some time. So my visit to KNC was predictably a bit of a waste of time, but luckily my main target for this visit to Krabi can be found much closer to town: Mangrove Pitta. I had heard they are easier to find here in the rainy season, whereas most birders visit in the dry. The mangrove boardwalk beside the river, just north of the tourist area of Krabi town, is a well-known spot for them. Starting at first light, I spent three hours walking slowly up and down the boardwalk, with no sight nor sound of a pitta. Returning in the afternoon, I did something I almost never do, and played the tape of Mangrove Pitta song from my laptop. Again nothing until very near the far end of the boardwalk, when a pitta finally responded. I had brief flight views as it swooped past me, then I fortunately located it in a tree where I had good views for some 10-15 seconds. Finally, one of Thailand’s “easier” (relatively speaking) pittas was safely on my list after quite a few previous attempts. Aside from the Mangrove Pitta, I was kept entertained in the mangroves by several magnificent Brown-winged Kingfishers, while over the river at the end of the walkway some Rufous-bellied Swallows were flying about. These distinctive birds have been recently split from Striated Swallow, and are therefore another bona fide addition to my list. South Thailand lifers: Red-crowned Barbet, Square-tailed Drongo Cuckoo, Rufous-bellied Swallow, Mangrove Pitta (total 1,964). South Thailand 2015 Year Ticks: Red-throated Barbet, Yellow-breasted Flowerpecker, Rufous Piculet, Chestnut-winged Babbler, Yellow-bellied Bulbul, Brown-winged Kingfisher (total 824). 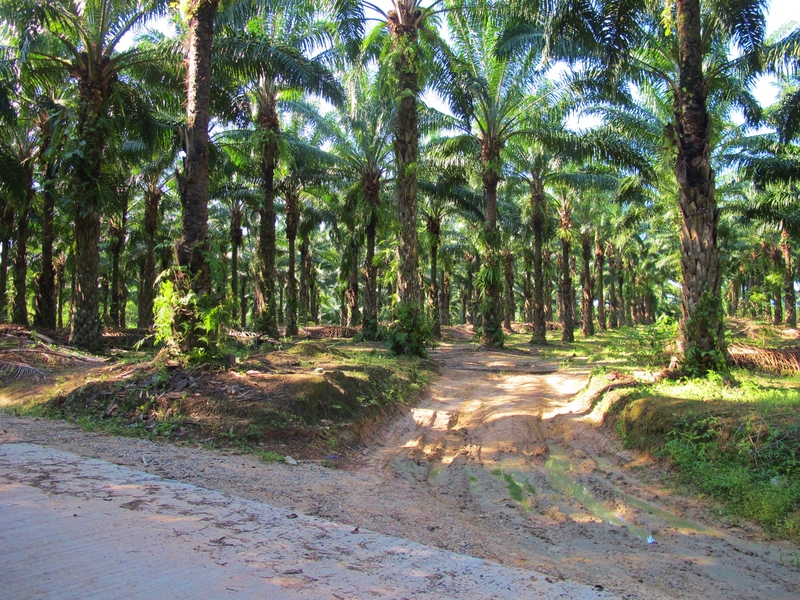 Oil palms, an ever-increasing sight at Khao Nor Chu Chi. Now that Gurney’s Pitta has been extirpated from the site, the future for the remaining lowland tropical rainforest here looks bleak.